The New England Patriots are giving their critics plenty of material to work with. The Patriots suffered their second consecutive loss Sunday, falling 17-10 to the Pittsburgh Steelers in a defeat that put their Super Bowl aspirations in serious jeopardy. So, does Sunday's loss prove New England is headed for an early postseason exit? Former NFL head coach and bitter Patriots rival-turned-ESPN analyst Rex Ryan believes so. "Eventually, Father Time catches up to you." Ryan had particularly strong words for Patriots tight end Rob Gronkowski, who in Ryan's eyes is nowhere close to the player he used to be. "You look at Gronkowski, I mean, he's running with a piano on his back," Ryan said on ESPN's "Get Up!" morning show. "He's not healthy." The former New York Jets coach expanded on his critique of Gronkowski earlier in the show. "I've been saying it forever: They look older and they look slower to me," Ryan said. "And I tell you what: Gronkowski, he must really be hurt. "Number one, he looked gassed. Why? Because you're not practicing. And then the other thing is, he looks slow and stiff to me. They've got to get him back." The 29-year-old tight end had another quiet game Sunday, catching just two passes for 21 yards on five targets. 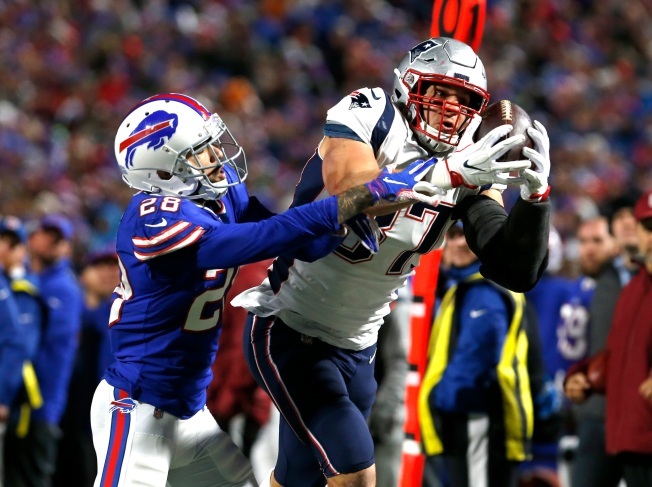 Two of those targets came on the Patriots' final drive, when quarterback Tom Brady tried to force the ball to Gronkowski in the end zone to no avail. Brady also didn't escape Ryan's criticism. "I don't know what's going on with Tom," Ryan said. "Now look, he's still about as good as it gets. But he's not as good as he's been, and I think you can say that for a lot of these Patriots." Pundits predicting the Patriots' demise is an annual occurrence at this point, but New England is in more dire straits this year than in years past. Whether Brady and Co. can make Ryan eat his words remains to be seen.